Top row (left to right): 1. Mauricio Prado, 2. Julie Larson, 3. Frank Cruz, 4. Susan Wainwright, 5. Matthew Matuska, 6. Lynette Shonyo, 7. Christopher Pirosko. Second row: 1. Cathy Brown, 2. Daniel Happe, 3. Arlene Schauer, 4. Todd DeSantis, 5. Corinne Daniels, 6. Matthew Fojut, 7. Theresa Setzer. Third row: 1. John Bossler, 2. Christina Lurton, 3. David Hauck, 4. Emily Stocking, 5. Anthony Sarboraria, 6. Beth Snow, 7. Ricky Reitz. Fourth row: 1. Anne Scagliotti, 2. Matthew Irwin, 3. Jennifer Janzen, 4. Jeffrey Gonsalves, 5. Maura Street, 6. Scott Carrano, 7. Jeanne Marie Maldarelli. Fifth row: 1. Peter Saccullo, 2. Theresa Torrez, 3. Ronald Graber, 4. Victoria O'Reilly, 5. James Keller, 6. Lance Pontrelli, 7. James Kell. Sixth row: 1. Lynn Riera, 2. Nicholas Lanier, 3. David Galles, 4. Kevin Avila. Seventh row: 1. Monsignor R. G. Adams, 2. Sister M. Emmanuel, O.P., 3. Mrs. Noonan, 4. Daniel VanBuren. Credits: From the collection of Jim Street. The kids in the picture are members of the high school graduation class of 1988. To find other pictures of the class of 1988 in the archive, see Livermore class pictures listed by year of high school graduation: 1988. 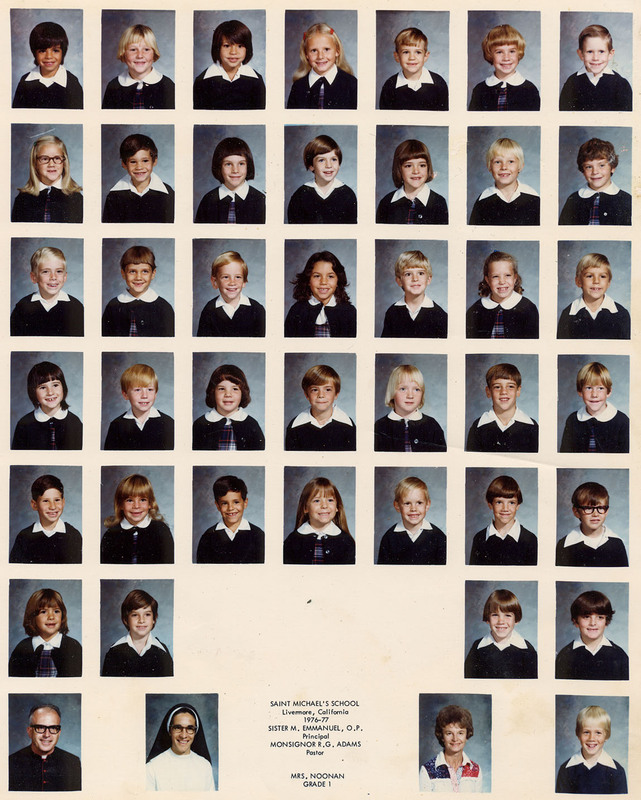 And if you have any pictures of the class of 1988 that you would like to share, please submit them to the Archive.